1985 EASYRIDERS. DAVID MANN. JANUARY & MARCH. WITH THE ARTWORK OF. Cycle World Magazine's. CYCLE MAGAZINE. Full year of 1985. Very nice collectible lot. with typical age and storage wear. 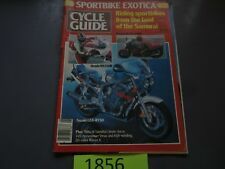 Harley Davidson Enthusiast Magazine-1985 in excellent condition. MAG Box 16. This is in overall fair condition. This shows wear from use, display, handling and or age as noted in the photos. The actual item is represented in the above photos. MAG Box 11. This is in overall fair / good condition. This shows wear from use, display, handling and or age as noted in the photos. The actual item is represented in the above photos. CYCLE GUIDE MOTORCYCLE MAGAZINE. JANUARY 1985. '31 WINDHOFF 4. BENCHRACING WITH MALDWYN JONES PT.1-PT.3. '29 CLEVELAND 4. 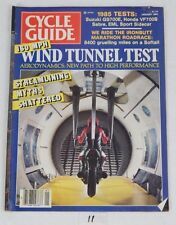 THE PICTURE IS A SCAN OF THE ACTUAL MAGAZINE YOU ARE PURCHASING IT IS COMPLETE AND IN LIKE NEW CONDITION. (SEE PHOTO) A GOOD SOLID MAGAZINE WITH NO LOOSE PAGES. 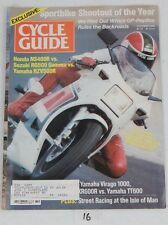 APRIL 1985 CYCLE WORLD MAGAZINE BMW K100RT,HONDA GL1200, CR250R, KAWASAKI KX250! Cycle News Newspaper - December 18, 1985. Top right corner is cut out. Yellowing from age. This is a 30 plus year old publication and shows wear. Zoom in and inspect all pictures for condition. Cycle News Newspaper - February 20, 1985. Top right corner is cut out. Yellowing from age. This is a 30 plus year old publication and shows wear. Zoom in and inspect all pictures for condition. 1985 SIDECARIST. Part: This is a USED COLLECTION OF MAGAZINES. We are a motorcycle salvage yard located here in Minnesota and hope you check back often.